Hortus Camdenensis | Abies cephalonica Loud. A variable species. ‘The Abies which forms the subject of our illustration was first described as A. cephalonica in 1838 from specimens raised in England from seed sent home in 1824 by General Charles Napier, then Governor of Cephalonia. Loudon, the author of the species, at the time believed that it is confined to Cephalonia. It so happens that in the same year (1838) H. F. Link, then Director of the Botanic Garden at Berlin, collected on Mount Parnassos specimens of a Silver Fir which at first he considered identical with the tree from Cephalonia. But when he subsequently saw the figure of A. cephalonica given by Forbes in the Hortus Woburnensis and the actual specimen of the tree in the park at Woburn, Link formed the conclusion that the Mount Parnassos tree was different from A. cephalonica, and in 1841 described his plant as A. Apollinis. 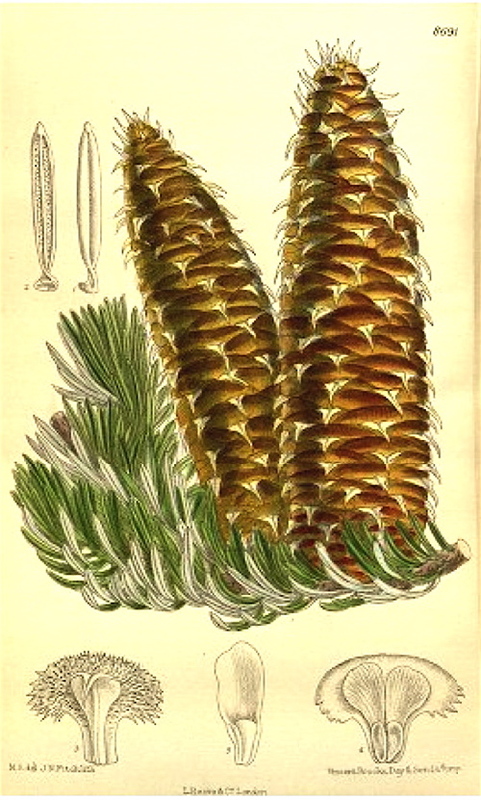 In 1847 Endlicher accepted the Silver Fir from Cephalonia as a distinct species, Pinus cephalonica Endl., but treated the Mount Parassos one as a form of the common Silver Fir, Pinus Abies Apollinis. The discovery in 1856 of a forest of Silver Fir in the heart of the Peloponnesos by J. Schmidt, then Director of the Athens Botanic Garden, and in 1860 by Heldreitch of another Silver Fir forest on Mount Voidhias, the Panachaicon of the ancients, in Achaia, led to the publication of descriptions of two more species of Abies from Greece, A. reginae Amaliae Heldr., and A. panachaica Heldr., though of these the former had in 1858 been referred to by Koch as A. peloponnesiact. In 1851 Wenderoth, when placing the Cephalonian tree in the genus Picea, described it as P. kukunaria, from the local vernacular name. Since 1860 Silver Firs have been observed in many localities in Greece, Thessaly and Macedonia, and the synonymy cited by Dr. Stapf reflects well the confusing diversity of opinion which has prevailed as to their relative status, the extreme view varying from that of Heldreich, who has considered that four distinct species are involved, and that of Parlatore, who has not only treated all of them as forms of one tree, but has regarded the Greek Silver Fir as merely a variety of the common Silver Fir of Central Europe.’ [BM t.8691/1916]. Listed in the 1850 and 1857 catalogues [C.3/1850]. Pinus cephalonica was included in a consignment of plants sent from Kew by John Bidwill in November 1843 [AJCP]. This is a probable source.